Speed your studies with this pre-built 293 TN-based cell line for monitoring NF-κB signaling in real time. We’ve already integrated an expression cassette that includes NF-κB-responsive transcriptional elements upstream of a minimal CMV promoter (mCMV)-GFP-luciferase cassette. 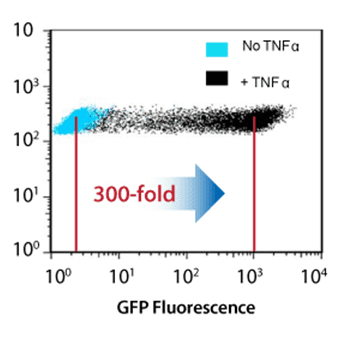 Expression of GFP (up to 300-fold over background) and luciferase only occurs in the presence of active NF-κB signaling, enabling screening for genetic and/or small molecule inhibitors and activators of the NF-κB signaling pathway. Use GFP fluorescence for live cell imaging and FACS, or luciferase activity to quantitatively measure activity of the signaling pathway.